The WA Government has let a tender for the product, with the successful bidder or bidders expected to be announced this month. WA’s Forest Products Commission (FPC), which is responsible for the sustainable harvesting and regeneration of the state’s plantation and native forest resource, is overseeing the process. 1600 tonnes per annum from 45 ha at Harvey Coast. Localities totalling 40 hectares in size make up 1200ha, excluding share farms. Patch sizes on average can be from 4ha to 13ha; localities with smaller areas negotiable. Share farms make up only a small part of the resource. In next year’s harvesting schedule, only 100ha of the 1200ha is expected to be on share farms. The commission has encouraged bidders to provide alternative specifications, but they were initially required to meet the original specifications. 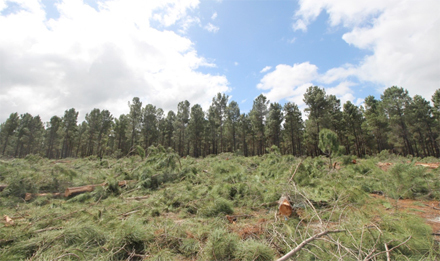 The residue will be left over from clear-felling operations where log products have already been extracted. It will either be left in the forest or taken away. The FPC stipulated that the residue would not be carted away by truck but should be chipped on the spot. The commission will be responsible throughout the harvest stage. The areas cited in the tender have roads in place, but there could be an issue when slash or residues are pulled up to a landing. The average hauling distance to the port of Bunbury is 50-60 kilometres. The FPC said there was no upper limit on the break. It is unclear how much residue will be obtained. The FPC said it was part of the group’s own “learning curve”. “The quantity is estimated at 50 tonnes per hectare, although this will vary across sites. “The forest has been tended in different ways, which has resulted in a variety of slash levels at clear felling,” the FPC said. The areas are available all year round, subject to seasonal and other weather. FPC said it would consider any proposal to store stock at the roadside.